Will YOU be a second-class crime victim after Tory cuts reduce police numbers again? 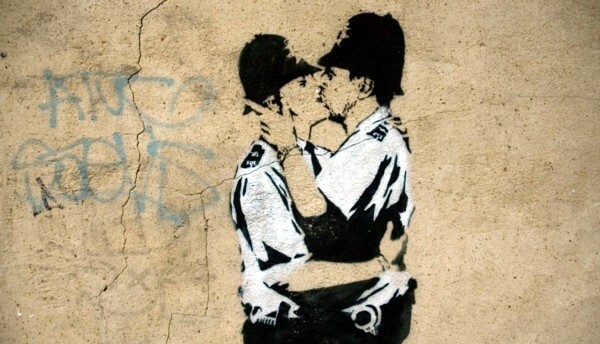 Hard to say goodbye: But cuts to police numbers, driven by the Conservative Party, will have a harsh impact on crimefighting [Image: Banksy]. The Tories will be salivating about this, because it brings their dream of private policing closer. If your chances of having a crime investigated personally by police officers are cut because you’re not elderly, don’t have learning difficulties or can’t speak English well (this will really rub the racists the wrong way), wouldn’t you want to pay for your law enforcement – if you’re rich enough? Meanwhile the rest of us can look forward to increasing lawlessness as criminals realise that we are at their mercy (and they don’t have any). That’s a situation that unscrupulous politicians and employers can use to their advantage, of course. I’m sure you can work out the ways. Police have admitted that they will run into “difficult areas” as the planned new “triage” system comes into force. Some of us may find ourselves living in “difficult areas”, thanks to these cuts. And let’s not forget, there is absolutely no reason for policing to be cut at all. The Tory talk for the last seven years – that there is no money, has long since been exposed as a lie. Remember that, when you dial 999 only to be told that nobody is available to help you. Police will increasingly have to prioritise whom they respond to in person as budget cuts bite deeper and deeper over the next few years, a senior officer in the country’s largest force has said. The Met police’s deputy commissioner, Craig Mackey, said Scotland Yard would probably have to concentrate on the more vulnerable as the number of officers at its disposal fell. He said elderly people, as well as people with learning difficulties and those who did not have a strong grasp of English, would be more likely to be assessed as in need of a face-to-face visit from an officer. He added that certain types of crime, such as burglaries, would usually elicit a response in person. With cases such as vehicle crime, however, the vulnerability of the victim was likely to be taken into account. Downtown Beirut in the 80’s restricted police presence, do they remember what happened there? did the various minorities begin inviting each other for tiff-in, hold festivals of unity, wave a joyful hello in passing, I don’t think so, of course this triage would not apply to politicians, that would not be in the national interest’s; Here we come. But of course the lying Tories are denying that their cuts in spending are the route cause of this. Just listen to David Davis, MP for Monmouth, on today’s Todat programme.